A craftsman shows off his work of three pentacles to his patrons. This is sometimes known as the "craftsman's card," and it relates to doing a job so well or uniquely that it gains patronage. Some readers find this card confusing as it shows a "master" craftsman at Three, but the card of apprenticeship is at Eight. Shouldn't "apprenticeship" come first? 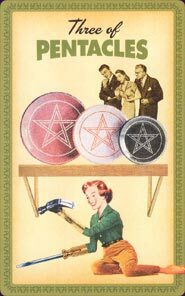 Actually, the Three of Pentacles isn't really about being a master of your craft, and the Eight of Pentacles, when it's about apprenticeship, is usually about learning something new and different. So cards are not as out of order as they seem. We will get to the Eight later, but for right now it's important to understand that the focus of the Three of Pentacles isn't on the craftsman. It's on the investors. We might well be reminded of two young men who created one of the first desktop computers in their garage. They weren't master computer-makers at the time, but their product caught the attention of investors and they were able to put their work and time into making more. This is what the card is all about. The querent is or will be given the money or opportunity to nurture and develop something. A friend might give them funding, or their boss might give them more time to work on a project. Health wise, this card can also indicate positive results from a new exercise program or therapy. That initial bout of work has paid off. Learn the Three of Pentacles tarot card meaning and the rest of the card meanings, symbols and stories in our eBook.